Instagram has announced they have reached a new user milestone of 700 million monthly active users, growth of 100 million alone in the past four months. We’ve made it even easier for people across the globe to join the Instagram community, share their experiences and strengthen connections to their friends and passions. With new features like stories, live video and disappearing messages in Direct, people now have more ways than ever to express themselves and feel closer to what matters to them. According to Recode, this recent growth is faster than before for Instagram, compared to the nine months it took to grow from 400 to 500 million and the six months from 500 to 600 million. 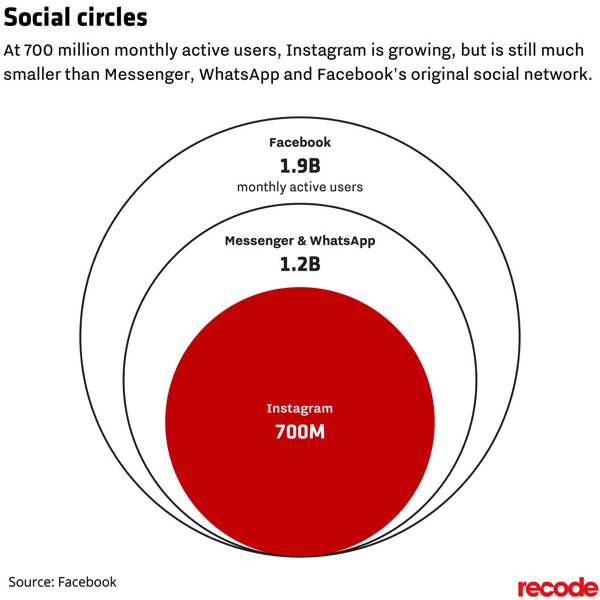 Above is a graphic comparing Instagram’s user base to Messenger, WhatsApp and Facebook. Overall, Facebook and its four apps are amassing a huge number of users, and from its recent trajectory, these numbers look to continue to keep getting higher and higher.